The last few posts all concern the recovery of internet history created by the Safari browser. I like to think of internet history in the wider sense and consider any artefact that demonstrates that a user visited a URL at a particular time. Recovering Safari browser history from unallocated deals with history. Safari browser cache -examination of Cache.db deals with the cache. Never mind the cookies lets carve the crumbs - Safari Cookie stuff looks at Cookies. Safari History - spotlight webhistory artefacts examines Spotlight snapshots of web pages accessed with Safari. Used to store details of the last browser session allowing a user to select Reopen All Windows from Last Session from the safari history menu. Used to store the associations between websites and their favicons. TopSites is a gallery of recently visited web sites. The binary TopSites.plist details the websites featured in this gallery. The image representing each webpage is stored within the Webpage Previews folder. This folder also stores any Quicklook representation of a webpage, for example when managing Bookmarks or reviewing History. File names of files in the Webpage Previews folder are the MD5 of the associated URL. Safari monitors whether a page has altered since it was last viewed and appends a blue star to the TopSites view for those sites that have. The xml files in PubSub/Feeds are connected with the monitoring. An xml plist the contents of which are self explanatory. A binary plist that may be connected to Safari spotlight web history artefacts. As is becoming a recurring theme with my Safari examinations I have turned to Blade to carve out Safari Cookie data from unallocated. The Cookie.plist consists of an array of dictionary objects. 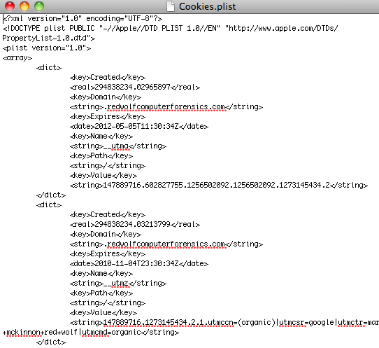 Using Apple's Property List Editor it can be seen that this Cookie.plist has an array of 7074 Dictionary objects. Each Dictionary object is a Cookie in its own right. 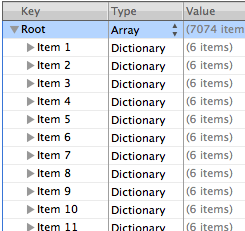 Looking at the underlying XML you can see how each dictionary object is structured. In creating a recovery profile I considered whether I wanted to carve out deleted cookie plists in their entirety or whether I should carve each dictionary object separately. These dictionary objects are fragments of the cookie.plist - hence the crumb reference in the title -after all fragments of cookies are clearly crumbs. I decided that it would be a more thorough search if I carved for the dictionary objects themselves and the following Blade data recovery profile did the business (this data is extracted from Blade's audit log -another neat feature). If your case is anything like mine you will carve out thousands and thousands of individual cookies (or at least the cookie data represented in XML). There are a number of options to process this data further. Drag output into Encase as single files. Run Encase Comprehensive Internet History search.View results on records tab. There are two issues with this method. Firstly Encase does not parse the Cookie created date which is stored as an CFAbsolute timestamp. Secondly there is the issue of duplicates. You will have thousands and thousands of duplicates. These can be managed by hashing the carved files. I would also recommend running the data recovery profile over any live cookie.plists, loading the output into Encase as single files, hashing the output and then creating a hash set. This hash set will allow you to spot additional cookies over and above those in the live cookie plists in any cookies carved from unallocated. Concatenate the contents of each output folder by navigating to the folder at the command prompt and executing the command copy *.plist combined.plist.With a text editor add the plist header and array tag at the beginning of combined.plist and the closing plist and array tags at the end.Make sure the formatting of combined.plist looks OK with a text editor.Process combined.plist with Jake Cunningham's safari cookie plist parser. 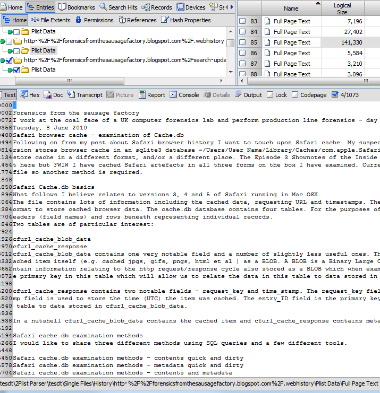 I then use Excel's text import wizard to import the edited cookies.txt setting the delimiter to the pipe symbol | only. This results in each row relating to one cookie. You can then utilise Excel's very powerful duplicate removal tool.Both the Mac and Windows versions work OK and the utility converts the CFAbsolute formatted cookie created timestamp. June is Safari month here in the Sausage Factory and this post is the third in the series. Just imagine having an observation point in the house across the road from your suspect. When the suspect surfs the internet the man in the OP (with the help of a good pair of binoculars) makes notes of what he reads on screen (OK.. he may use a long lens instead of binoculars and take photos but bear with me). Essentially this is exactly what Spotlight does when a user utilises the Safari web browser (versions 3,4 and 5) to view web pages - it writes the URL, Web Page Title and all the text content in the web page into a file. 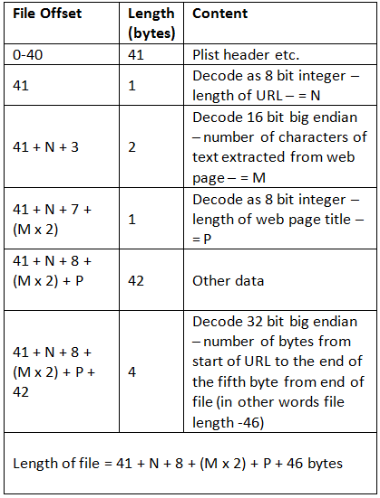 It can be seen that it is possible to deduce information from these files that amounts to internet history and therefore it it may be appropriate to consider this data along with records extracted from history.plist and cache.db files. 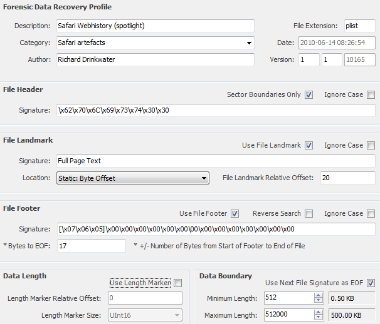 Running this profile resulted in the recovery of over ten thousand files. I then added the recovered files into Encase as single files. I noticed that a small percentage of these files had the text content stored as ascii and not unicode text. I am at this stage not sure why. If you review these files using Encase you will see in the View (bottom) pane the relevant data -the URL is at the start of the file, followed by the text in unicode and then the webpage title near the end of the file. If the content is relevant reporting on it is a pain -potentially three sweeping bookmarks are required using two different text styles. The unicode text sweeping bookmark is also likely to be truncated due its length. Therefore reviewing any number of these files this way is not a good plan. The eagle eyed amongst you will have observed that in my Blade Data Recovery Profile I gave the recovered files a plist file extension (as opposed to a webhistory file extension). This because these files have a binary plist structure and I use Simon Key's binary Plist Parser v3.5 enscript to parse them. This excellent enscript allows the option to create a logical evidence file which creates a file for each plist name/value pair. I run the enscript with this option, add the logical evidence file back into my case and the review the contents with just a unicode text style selected and bookmark as appropriate. This method is much quicker and removes the need to mess about with unicode formatting. It also makes keyword searching easier. For example to view all URLs green plate (set include) your logical evidence file, apply a sort to the name column in the table pane, scroll down to cause each URL to appear in turn in the view pane. Use a similar method for the Full Page Text and Name items.